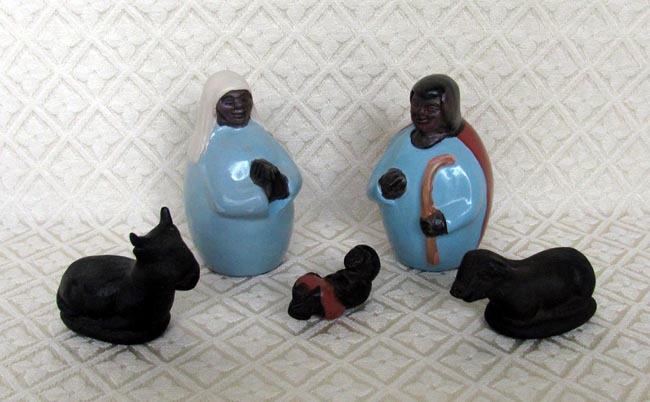 This clay Holy Family was made by Pablo Vilchez in Chulucanas, Peru. The Nativity includes Joseph, Mary, baby Jesus, an ox, and a sheep. Pablo signed his name on the bottom of the Joseph and Mary figures. Joseph measures 3.5 inches tall. Pablo Vilchez was born in 1951. He began to work at the age of 14 crafting rustic products such as pots for cooking. Ten years later he began to develop pieces for export such as vases, plates, vessels and utilitarian pieces in black and white. Pablo currently has his own studio where his family works with him. He is married and has seven children: five daughters and two sons. The family crafts the pieces by hand, using a potter's wheel to give them shape. "I work with ceramics because it is the heritage of my ancestors," Pablo explains. Clay pottery from Chulucanas, a small town on the north coast of Peru, is uniquely created. First, the piece is formed using several techniques: paddling, rolling, tableting, and using a wheel or an extruder. The artist shapes the pottery using a small stone, a wooden paddle, and even the inner sole of his foot. Once shaped and in a leathery state, the piece is painted with a slip made from clay and pigment. Then comes the burnishing or polishing which includes rubbing the entire visible surface with river stones of several forms and sizes to obtain a fully satin and homogenous surface. This operation is repeated three times and requires great skill so that the piece will not be damaged or cracked. Once dry, the figure is stacked in the wood-fired kiln and heated to a temperature of approximately 700 to 900 degrees centigrade. The next step is the decoration, or slip casting, in which liquid clay is used to cover the areas that are to be kept intact, while the areas the potter wishes to darken are left uncovered. This method is knows as “reverse.” The decorated piece is then loaded into the smoke kiln where burning mango leaves will produce smoke that will darken the piece. A resin is also applied that adheres to the piece, giving it the characteristic brilliance of the Chulucanas style. This firing is done two or three times until the desired shade of brown or black is obtained. The pieces are then cleaned to remove the slip and a final finish wax is applied to highlight the impeccable satin characteristic.